Taking care of your home means looking after the outside as well as the inside, and nothing makes a home look more beautiful from the outside than a healthy green lawn free of weeds. However, many commercial weed killers contain harsh chemicals that may be doing more harm to the environment than good. That’s why we love discovering natural weed killer techniques. To stay on top of weed control, you need to think ahead. Even if you don’t start seeing weeds in your garden or lawn until summer, that doesn’t mean you should wait to take matters in hand. Natural weed control is all about understanding how weeds grow and what organic solutions will kill them. In this article, we’ll discuss what ingredients and recipes work best to stop weeds in their tracks. However, the best natural weed control requires being vigilant and diligent. Watch areas that are prone to weeds and use any of these techniques as early as you can. Taking action before the problem gets out of control is essential to proper weed control. 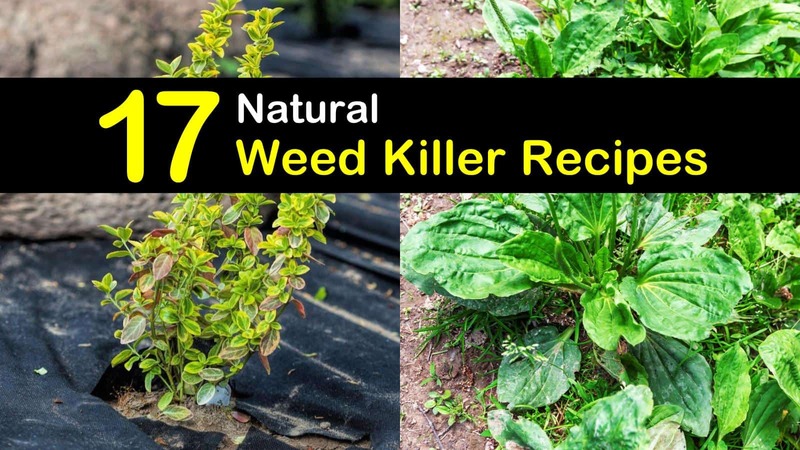 This natural weed killer recipe is one of the most basic but effective homemade mixes out there. As this recipe doesn’t include chemicals, it may require a few applications, as the mixture isn’t able to penetrate to the root systems in one go. Mix ingredients in a spray bottle and apply to weeds as needed. It is always best to use it on young weeds before they get out of hand. This mixture also works on poison ivy and is most effective if you apply it to unwanted plants or areas of your lawn on a dry, sunny day. Landscape fabric is the most proactive natural weed control solutions, as it prevents weeds from sprouting in the first place. By laying down landscape fabric, you are creating a physical barrier that nothing can grow through. This solution works best around shrubs and trees, where it will likely not need to move for many years. It works great if you’re looking to protect a large area from weed growth. Sometimes killing weeds is as easy as boiling some water. This quick fix is particularly useful when unwanted sprouts pop up in cement or concrete surfaces like driveways or sidewalks, as you won’t risk damaging the area. Just boil some tap water on the stove and pour it on the weeds. Like many other techniques, this natural weed killer works best on newly sprouted plants. This DIY weed and grass killer is another one that might sound too simple to get results, but it is useful. Weeds need sunlight to survive, and if you take away that source, then the plant cannot flourish. Place newspaper over low-growing weeds like crabgrass and clover to eliminate sunlight. Paper can also work as a homemade substitute for landscape fabric, so if you throw a little mulch on top before covering it with soil, you could help prevent weeds from sprouting. This homemade weed killer recipe is so powerful that you won’t want to spray it anywhere near your garden. Yes, it will kill weeds, but it will also eliminate any other plant it touches! It is useful because the ingredients work together to break surface tension so that the active ingredient can get the job done. Combine all essential oils and the soap in a spray bottle and mix. Pour in the vinegar, replace lid, and shake to combine. Spray on any pesky weeds or unwanted plants, but avoid plants you want to keep living. This natural weed killer recipe may be best for sidewalks and driveways. Mulch is another easy fix for weed control that prevents these unwanted plants from growing. It works great to stop garden weeds from developing and is useful in areas with bushes and trees, but you should keep it off your lawn. It helps keep the soil healthy for your plants and shrubs but prevents sunlight from getting through to weeds. We recommend spreading mulch about two inches deep on soil that you want to keep free of weeds. Mulch works perfectly in combination with other ground cover options as well. If you can’t seem to get rid of weeds on your lawn, the problem could be with the grass itself. Taller grass makes lawns less susceptible to unwanted plants, so it could be that you’re cutting your grass too short. Adjust the height of your lawn mower to allow your grass to grow to approximately two to three and a half inches, and make sure to cut it before weeds have a chance to set seeds. Being strategic about planting can make all the difference when it comes to stopping weeds in their tracks. Nearby plants will fight to survive, taking up the sunlight, water, and other nutrients from the soil that weeds need to thrive. More competition means the plants or grasses you don’t want are less likely to make it. Good plants to include in your garden are ones that will block out the sun from the soil beneath. Strategically spacing the plants is also essential to this natural weed killer strategy. A do-it-yourself hydroperoxide mix is another effective weed killer. It works great in your garden or on your lawn as a spot killer. 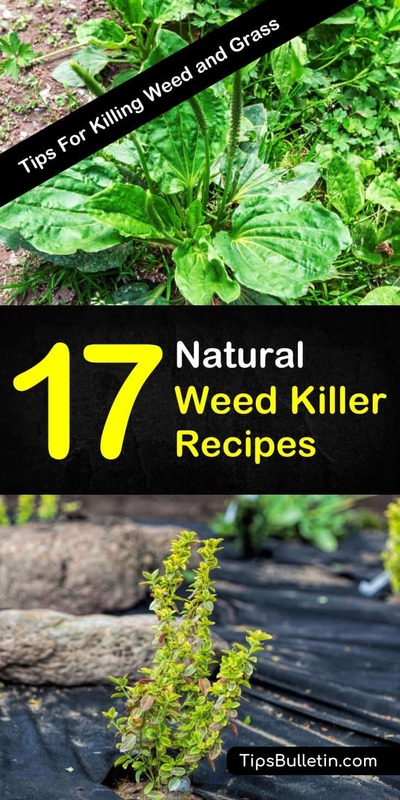 This is one of the easiest homemade weed killer recipes to make on this list. Mix one ounce of hydrogen peroxide (3%) with one quart of water in a spray bottle. Spray weeds on your property and let the mix sit for fifteen minutes before rinsing with water. There are many uses for Epsom salts in the garden, and homemade weed killer is one of them. Mix some Epsom salt with vinegar in a spray bottle and apply to any areas where you want to prevent weeds. For an even simpler solution, you can sprinkle rock salt on garden paths or along lawn edgings to keep weeds at bay. If you can’t get rock salt, table salt will also work. This natural weed and grass killer is perfect for spot treatment so that you can target the unwanted grasses cropping up in your yard. In a large bucket, combine vinegar, orange oil, and dish detergent. Stir with a long-handled wooden spoon until mixed. Using a funnel, pour the mixture into a garden sprayer. Spray the weeds with the killer solution at the hottest time of day and repeat after two days. Sometimes the best solution for keeping your property weed-free is to get your hands dirty. Though this is the most labor-intensive technique, it also works the best. Be sure to dig the weeds up from beneath the soil using a trowel or screwdriver. This is easiest to accomplish after a rainfall when the soil is moist and looser. Make sure to dispose of the weeds in a garbage bag or other airtight container right away so that seeds don’t get loose. While it’s a crucial ingredient in many of our natural weed killer recipes, spraying vinegar on plants is useful in and of itself. While household vinegar is helpful, we recommend using a product with 20% acetic acid. Vinegar will kill any plant it comes into contact with, so be very careful where you’re spraying. Citrus oils or citrus juices make great weed killers. Many commercial herbicides contain citrus oil from lemons, oranges, or grapefruits. For a homemade weed killer, fill a spray bottle with lemon juice and apply liberally to the weeds. For more power, add in some vinegar. This solution is even more organic if you take juice from your own lemon trees! Retaining walls are another solution that uses physical barriers to prevent the spread and growth of weeds. We like this technique because it is long-lasting and doesn’t require ongoing maintenance. Use scraps of decking boards or other solid materials to create edging around your garden. Cut them into eight-inch pieces and hammer them into the ground side-by-side. You can easily use baking soda to kill weeds on your property. Sprinkle it along walkways or around your patio. It is especially useful for weeds that sprout up through cracks in paved surfaces. Sweep baking soda into these cracks with a whisk broom to make sure it gets in every space. One of the most effective DIY weed control methods is having healthy grass. Having a healthy lawn starts with even the smallest details. Find out what kind of grass grows best in your area, whether it’s Bermuda grass, bluegrass, Bahia, or bentgrass. This has a lot to do with geographical location and climate, so what thrives in California might not work in New York. If your lawn is healthy, then there won’t be any nutrients left for weeds to sprout. These natural weed and grass killer solutions are easy to follow and will give you the results you want. If you follow our tips and recipes for natural weed killer, your property will look picture-perfect in no time.